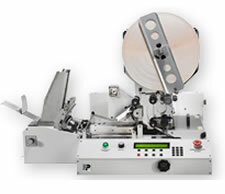 This multiple tabber/stamp affixer is the only tabber machine available in its price range that tabs 1 to 3 tabs or stamps in-line. Capable of handling medium range production consistently, reliably, and quickly, it works at speeds of up to 25,000 pieces per hour placing accurate and tight closed tabs. Friendly firmware enables easy setup and smooth operation.